The Great Plains Conference Connecting Council learned about the progress of networks across Kansas and Nebraska, discussed concepts in the book “The Anatomy of Peace” and took part in a town hall-style dialogue associated with possible proposals from the Commission on a Way Forward during the group’s spring meeting April 20-21 in Topeka. Amid Friday’s business items of approving manual revisions for Disaster Response, accepting a report about Great Plains Camps and learning about next steps in the establishment of a Native American Commission, the Rev. Cindy Karges, superintendent of the Gateway and Great West districts, provided an update on networks in the conference. The networks were introduced last year as a means of strengthening ties and sharing best practices among churches in a region. Most networks group together a larger church with several smaller congregations to work together to launch ministries, revitalize ministries and to provide support for one another. Karges said the launch and expansion in the use of networks will help as each of the conference’s 17 districts develop ministry strategies aimed at developing more vital congregations. “I think our networks and strategy teams can provide an avenue to hone in our focus and support our local churches,” Karges said. Each network, largely because of proximity, share a context for ministry, Karges said. She reflected on the use of networks for several years in the Great West District and how those experiences – along with those shared by other conferences – help us to learn and improve the networks already in place while also preparing for the launch of others. One in the Gateway District is taking steps to improve social media and the use of technology in its churches. One in the Great West District used a semi full of food to feed people stuck in a blizzard. One in the Hays District is sharing stewardship resources and are discussing a possible youth revival. One in Wichita pulled together leaders to help fill a void for Vacation Bible School. The Connecting Council reviewed final statistics for 2017. Average worship attendance declined 5.56 percent to 77,696 on an average Sunday. Membership in Great Plains Conference churches declined by 1.3 percent to 209,554. However, professions of faith increased by 7.82% to 4,327. The statistics showed improvements in terms of number of churches reporting professions of faith, the conducting of a confirmation classes and participating in hands-on mission work. Another positive statistic came in Easter attendance. With nearly all 1,007 congregations reporting, Great Plains Conference churches welcomed 147,829 people to Easter services, an 88 percent increase over an average Sunday. The smallest gathering was at Redfield (KS) United Methodist Church in the Five Rivers District. The largest gathering was about 29,000 at Church of the Resurrection in Leawood, Kansas. The Connecting Council approved a policy for use of the Urban Ministry Fund. Money for the fund is generated upon the sale of church properties in counties greater than 50,000 people. The counties are Johnson, Sedgwick, Wyandotte, Shawnee, Douglas, Leavenworth, Riley, Butler, Reno and Saline in Kansas and Douglas, Lancaster, Sarpy and Hall counties in Nebraska. Under the approved policy, which was presented by the Rev. Nathan Stanton, director of congregational excellence, money raised from the sale of church property would be available via grants of $120,000 or less to bolster existing or to launch new ministries in urban areas. “As churches are closed and their assets are sold, those funds transfer to the Trustees and stay with them,” Stanton said. Stanton said this policy will allow the conference to work with clergy and laity to put those funds – currently estimated at $350,000 – back to use in urban areas across Kansas and Nebraska. Stanton said the congregational excellence team and district strategy teams will determine how to track success, with an emphasis on accountability and telling the story of what comes from the projects funded through this source. The Connecting Council approved recommending to the annual conference session a 2019 budget totaling nearly $15.5 million in expenses, an increase of about 0.7 percent. See details of the proposed 2019 budget. Scott Brewer, conference treasurer and director of administrative services, said the increase is possible because of increased giving in 2017, meaning mission shares should increase by $122,769 in 2019. In all 52 percent of Great Plains churches reported increased giving in 2017. Also, the general church’s apportionment will decrease by 3.4 percent in 2019, meaning more funds raised in the Great Plains will be put to use for ministry in the two states. Brewer shared with the council that the conference building in Wichita has been sold, that the office in Lincoln has had several interested potential buyers, and the former Topeka office also has had some showings with commercial real estate agents. The Rev. Nancy Lambert, director of clergy excellence and assistant to the bishop, provided an update on the clergy leadership development plan approved in October by the Connecting Council. Funding for the plan is fully included in the 2019 budget proposal and reflects anticipated expenses less than the anticipated $149,000 because of some overlap in programs already administered by the clergy excellence team. “So far this year, one component of the leadership development plan is to have a retreat to encourage clergy to develop a plan for continuing education,” Lambert said. The process for such retreats already is under way with assessments from district superintendents and pastors in the Transition into Ministry program – a project aimed at younger pastors who have shown outstanding potential for clergy leadership who are assigned mentors that assist with development and skill-building. The first retreat is planned for the fall. 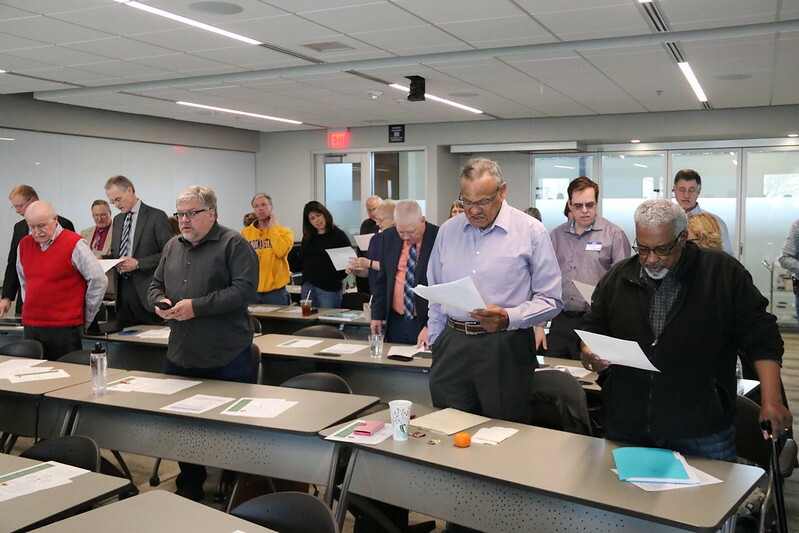 “Another component is to encourage clergy to be part of a covenant group – some group that holds them accountable for their own development, how they lead, to hold them responsible for their own individual spiritual and physical health,” Lambert said. Grants are available for groups of pastors who want to take part in their own retreat to kick off or bolster their efforts. Lambert also said that two sermon-planning retreats are planned for May. Stanton provided an abbreviated workshop on the book “The Anatomy of Peace,” a book by the Arbinger Institute that addresses conflict and explores how to avoid perpetuating the problems we think we are trying to solve. The book has been read by the Council of Bishops and the Commission on a Way Forward – the group of 32 people from across the denomination tasked with providing a recommendation to the bishops on how to move the denomination forward in unity despite differences on human sexuality. It tells the story of parents struggling with troubled children and with other problems that have consumed their lives. Two instructors of a wilderness camp for the troubled teens – an Israeli and a Muslim – demonstrate how to transform personal, profession and even global conflicts by seeing situations from another person’s perspective. Stanton explained that people engaged in disagreements often come to the situation with what the book – which is told as a narrative story – calls a “heart of war.” In this approach, we see adversaries as objects, so they are merely obstacles and are irrelevant. We should, instead, approach situations with a “heart of peace.” With this approach, we see others as people just like us, with hopes, needs, fears and cares as real as our own. One concept of the book is for people to get out of their self-affirming, self-protecting boxes. One is the “better-than” box that positions a person above others. Another is the “I deserve” box that allows a person to see himself or herself as a victim and to view others with mistrust. Another is the “must-be-seen” box that means a person has to be the center of attention and is judgmental toward others. And one final box is the “worse-than” box, meaning the person feels deficient and helpless and feels like the world is out to get him or her. One point of the book, Stanton said, is that all of us likely struggle with one or more of those boxes as we work with other people. Stanton concluded his workshop with brief reflections on Romans 7:19-20, Romans 2:22-25, Exodus 3:5 and Galatians 5:13-15. He stressed that Christians should embrace the acronym COGPOW – that each person is a child of God and person of eternal worth. Prior to Stanton’s presentation, Bishop Ruben Saenz Jr. provided a timeline of what he is calling the Forward in Unity process. The process includes the development and sharing of resources for local congregations as they address the upcoming special session of General Conference, scheduled for Feb. 23-26, 2019, in St. Louis. The process also includes town hall-style meetings to learn more about which proposal or options from the Commission on a Way Forward that the Council of Bishops will present to the General Conference. “We plan to take part in dialogue in all 17 districts from September to November of this year,” Bishop Saenz said. A optional two-hour session related to the Commission on a Way Forward is scheduled prior to the start of the annual conference session June 13, and one hour has been scheduled for dialogue or the sharing of information during the annual conference session’s plenary time. Following Stanton’s presentation of “The Anatomy of Peace,” Todd Seifert, communications director, walked the Connecting Council through a possible format for the town hall-style meetings. The presentation included an overview of potential proposals from the Commission on a Way Forward and dialogue surrounding those proposals, including some opinion polling on potential missional advantages and disadvantages of potential proposals using Mentimeter polling software. Approved changes to the Disaster Response handbook to allow for increases in financial assistance after a disaster, updating of language in various policies and to clarify some procedures in requests for funding. Heard an update on the establishment of a 12-person Native American Commission. A team is expected to be ready for approval as part of the nominations report during the annual conference session. Approved changes to policies and procedures, including some for the structure of the conference. One example is that only the dean of the cabinet and associate deans now are required to attend Connecting Council meetings instead of all district superintendents.